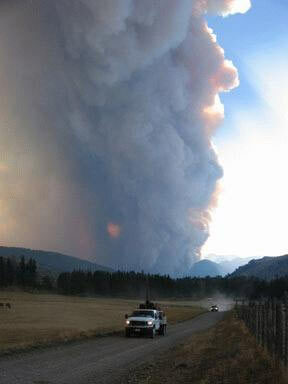 Jungle fire roars out of Absaroka-Beartooth Wilderness. Gov’t photo. I’m taking down the earlier story on the Jungle Fire because since then it has since roared out the West Boulder River and the Wildeness area, and burned all the way to the main Boulder River road. Several structures have been lost. Two days ago it was 5000 acres, at the beginning of Sept. 14, it was 20,000 acres. Now it is 32,000 acres. Fortunately, a summer-ending cold front has come into Montana (and Idaho), and the fire season may be over soon. Here is the latest fire map, late on Sept. 14. It’s a good one on top of the topographic map. Here is the latest news from the National Fire News (gov’t) web site. According to the Billings Gazette, the flames were up to 400 feet high late Thursday. Read Article.